Today GMA Lab joined the Global Strike for Climate, by organising an open-air seminar on the impacts of climate change on biodiversity. The event took place in the courtyard of the Zoology Institute at Sapienza University, featuring presentations from Carlo Rondinini, Moreno Di Marco, Michela Pacifici (Michela was on video during maternity leave! ), and Dino Biancolini. The session started with a presentation on IPCC 1.5°C report, and continued with an overview of the predicted impact of global climate change on the extinction risk of mammals and plants, and the risk of spread of alien species. Many students and academics joined the event and engaged in discussions with the speakers, before heading off to the Students Ride for Climate event and other activities organised by Sapienza University. Di Marco, M., Collen, B., Rondinini, C., & Mace, G. M. (2015). Historical drivers of extinction risk: using past evidence to direct future monitoring. Proceedings of the Royal Society B, 282, 20150928. Global commitments to halt biodiversity decline mean that it is essential to monitor species’ extinction risk. However, the work required to assess extinction risk is intensive. We demonstrate an alternative approach to monitoring extinction risk, based on the response of species to external conditions. Using retrospective International Union for Conservation of Nature Red List assessments, we classify transitions in the extinction risk of 497 mammalian carnivores and ungulates between 1975 and 2013. Species that moved to lower Red List categories, or remained Least Concern, were classified as ‘lower risk’; species that stayed in a threatened category, or moved to a higher category of risk, were classified as ‘higher risk’. Twenty-four predictor variables were used to predict transitions, including intrinsic traits (species biology) and external conditions (human pressure, distribution state and conservation interventions). The model correctly classified up to 90% of all transitions and revealed complex interactions between variables, such as protected areas (PAs) versus human impact. The most important predictors were: past extinction risk, PA extent, geographical range size, body size, taxonomic family and human impact. Our results suggest that monitoring a targeted set of metrics would efficiently identify species facing a higher risk, and could guide the allocation of resources between monitoring species’ extinction risk and monitoring external conditions. After their failure to achieve a significant reduction in the global rate of biodiversity loss by 2010, world governments adopted 20 new ambitious Aichi biodiversity targets to be met by 2020. Efforts to achieve one particular target can contribute to achieving others, but different targets may sometimes require conflicting solutions. Consequently, lack of strategic thinking might result, once again, in a failure to achieve global commitments to biodiversity conservation. We illustrate this dilemma by focusing on Aichi Target 11. This target requires an expansion of terrestrial protected area coverage, which could also contribute to reducing the loss of natural habitats (Target 5), reducing human-induced species decline and extinction (Target 12), and maintaining global carbon stocks (Target 15). We considered the potential impact of expanding protected areas to mitigate global deforestation and the consequences for the distribution of suitable habitat for >10,000 species of forest vertebrates (amphibians, birds, and mammals). 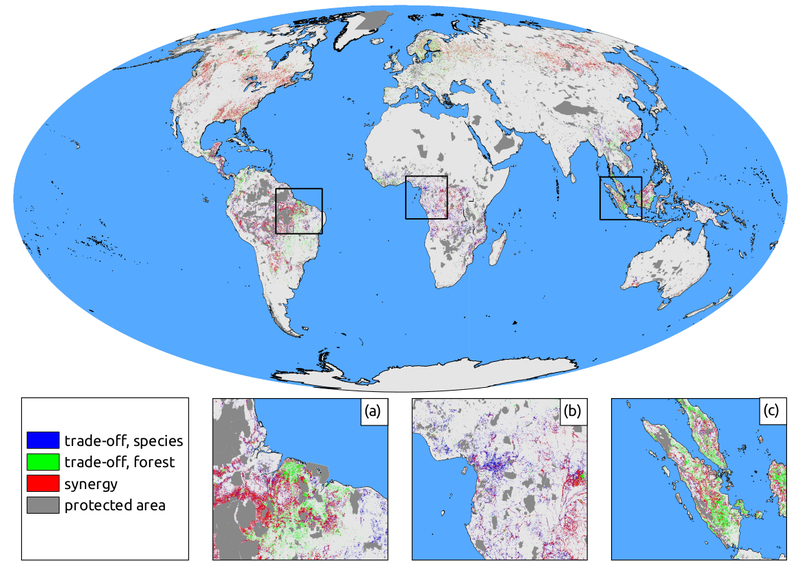 We first identified places where deforestation might have the highest impact on remaining forests and then identified places where deforestation might have the highest impact on forest vertebrates (considering aggregate suitable habitat for species). Expanding protected areas toward locations with the highest deforestation rates (Target 5) or the highest potential loss of aggregate species’ suitable habitat (Target 12) resulted in partially different protected area network configurations (overlapping with each other by about 73%). Moreover, the latter approach contributed to safeguarding about 30% more global carbon stocks than the former. Further investigation of synergies and trade-offs between targets would shed light on these and other complex interactions, such as the interaction between reducing overexploitation of natural resources (Targets 6, 7), controlling invasive alien species (Target 9), and preventing extinctions of native species (Target 12). Synergies between targets must be identified and secured soon and trade-offs must be minimized before the options for co-benefits are reduced by human pressures. 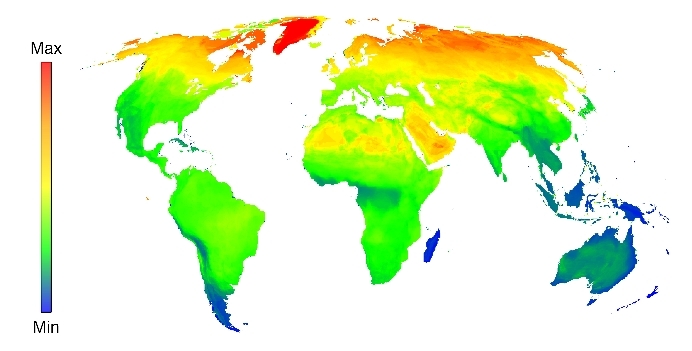 Mean values of geographic range size in terrestrial mammals. Geographic range size is the manifestation of complex interactions between intrinsic species traits and extrinsic environmental conditions. It is also a fundamental ecological attribute of species and a key extinction risk correlate. Past research has primarily focused on the role of biological and environmental predictors of range size, but macroecological patterns can also be distorted by human activities. Here we analyse the role of extrinsic (biogeography, habitat state, climate, human pressure) and intrinsic (biology) variables in predicting range size of the world’s terrestrial mammals. In particular, our aim is to compare the predictive ability of human pressure vs species biology. We evaluated the ability of 19 intrinsic and extrinsic variables in predicting range size for 4,867 terrestrial mammals. We repeated the analyses after excluding restricted-range species and performed separate analyses for species in different biogeographic realms and taxonomic groups. Our model had high predictive ability, and showed that climatic variables and human pressures are the most influential predictors of range size. Interestingly, human pressures predict current geographic range size better than biological traits. These findings were confirmed when repeating the analyses on large-ranged species, individual biogeographic regions and individual taxonomic groups. Climatic and human impacts have determined the extinction of mammal species in the past, and are the main factors shaping the present distribution of mammals. These factors also affect other vertebrate groups globally, and their influence on range size may be similar as well. Measuring climatic and human variables can allow to obtain approximate range size estimations for data deficient and newly discovered species (e.g. hundreds of mammal species worldwide). Our results support the need for a more careful consideration of the role of climate change and human impact – as opposed to species biological characteristics – in shaping species distribution ranges. Check out the recent ISSUE N. 369 of Philosophical Transactions B on Satellite remote sensing for biodiversity research and conservation applications. This issue includes two articles with coordination/participation of GMA lab members. Wegmann, M, Santini L, Leutner B, Safi K, Rocchini D, Bevanda M, Latifi, H, Dech S, Rondinini C. 2014 Role of African protected areas in maintaining connectivity for large mammals. Phil. Trans. R. Soc. B 369: 20130193. Download the PDF or ask us for a copy. Di Marco M, Buchanan GM, Szantoi Z, Holmgren M, Grottolo Marasini G, Gross D, Tranquilli S, Boitani L, Rondinini C. 2014 Drivers of extinction risk in African mammals: the interplay of distribution state, human pressure, conservation response and species biology. Phil. Trans. R. Soc. B 369: 20130198. Download the PDF or ask us for a copy. 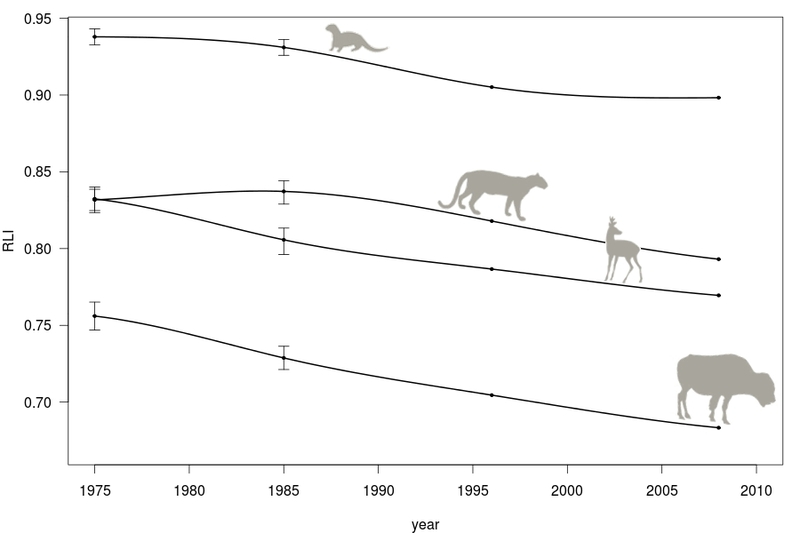 Trend in aggregated conservation status of small-bodied and large-bodied carnivores and ungulates (represented with the IUCN Red List Index, RLI) . Assessing temporal changes in species extinction risk is necessary for measuring conservation success or failure and for directing conservation resources toward species or regions that would benefit most. Yet, there is no long-term picture of genuine change that allows one to associate species extinction risk trends with drivers of change or conservation actions. Through a review of 40 years of IUCN-related literature sources on species conservation status (e.g., action plans, red-data books), we assigned retrospective red-list categories to the world’s carnivores and ungulates (2 groups with relatively long generation times) to examine how their extinction risk has changed since the 1970s. We then aggregated species’ categories to calculate a global trend in their extinction risk over time. A decline in the conservation status of carnivores and ungulates was underway 40 years ago and has since accelerated. One quarter of all species (n = 498) moved one or more categories closer to extinction globally, while almost half of the species moved closer to extinction in Southeast Asia. The conservation status of some species improved (toward less threatened categories), but for each species that improved in status 8 deteriorated. The status of large-bodied species, particularly those above 100 kg (including many iconic taxa), deteriorated significantly more than small-bodied species (below 10 kg). The trends we found are likely related to geopolitical events (such as the collapse of Soviet Union), international regulations (such as CITES), shifting cultural values, and natural resource exploitation (e.g., in Southeast Asia). Retrospective assessments of global species extinction risk reduce the risk of a shifting baseline syndrome, which can affect decisions on the desirable conservation status of species. Such assessments can help conservationists identify which conservation policies and strategies are or are not helping safeguard biodiversity and thus can improve future strategies. Check out a recent Nature Research Highlight on this paper. VISCONTI, P. M. DI MARCO, J. G. ALVAREZ-ROMERO, S. R. JANUCHOWSKI-HARTLEY, R.L. PRESSEY, R. WEEKS AND C. RONDININI. 2013.
into WDPA contributed up to 6.7% of additional protection tomarine ecosystems in the Philippines. We suggest ways for data providers to reduce the errors in spatial and ancillary data and ways for data users to mitigate the effects of these errors on biodiversity assessments. top-impacted species. The different representations of species’ distribution caused significant disagreement in HF calculations. HF values were on average lower when calculated in species’ suitable habitat or occurrence points in comparison to the whole geographic range. 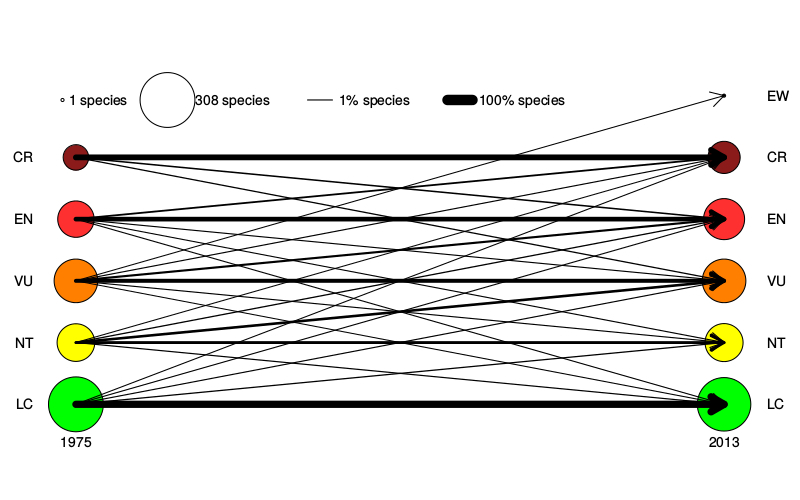 Biases were non-linear and dependent on distal factors, such as the proportion of suitable habitat within species’ range and species’ habitat specialism. techniques to quantify biodiversity threats will enhance the effectiveness of extinction risk analyses and conservation decisions. How ‘key’ should a ‘Key Biodiversity Area’ be? On 10th December 2012, Moreno Di Marco will present some of the GMA current projects during a seminar at ZSL. One quarter of all mammal species are today threatened with extinction, with both recent trends and future predictions pointing toward an imminent increase of that proportion. We investigate mechanisms and processes behind this decline and describe: (i) past trends in species extinction risk, (ii) cost-efficient conservation priorities and (iii) methodological challenges in measuring human impact on species. (i) Unlike birds or amphibians, little is known about the global extinction risk status of mammals before 1996. By collecting past information on the status of carnivores and ungulates, we calculated past trends in extinction risk for those species, and show spatial and temporal patterns in global species decline from the ’70s up to date. (ii) Current approaches at setting global conservation priorities generally focus on species with high extinction risk, species that may be hard to save. We took a different approach and detected terrestrial mammals that are currently threatened with extinction, but highly likely to recover (due to their biological traits). We show that many of them are excluded from existing conservation initiatives, while reducing human impact on those species represents a cost-effective conservation strategy. (iii) Threat quantification varies with methodology and the effect of this variability remains largely unexplored. We show how different methods, to quantify the human impact on mammals, result in values that differ largely among each other. This may lead to potentially mismatching interpretations for conservationists, and we discuss practical guidelines for application. An understanding of the biological and anthropogenic factors affecting global mammal decline and a consideration of the existing methodological challenges, will help conservation strategies to invert the current trend in global mammal decline.